Fruitbodies with partial veil, soon disrupting and leaving a ring in the upper part of the stipe. Cap up to 10 cm, with fine appressed scales, rusty to pale brown, usually dry, rarely viscid. 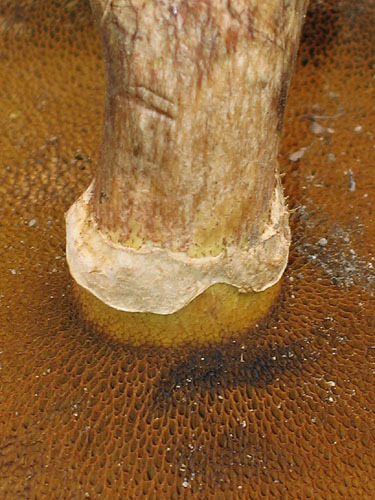 Stipe cylindrical or slightly swollen below, solid, straw or yellowish, darkening in the lower parts, below the tubes with a distinct ring. Flesh yellowish to yellowish-white, somewhat greenish in the stipe, mostly unchanging when exposed to air, or sometimes reddening in the cap or slightly blueing in the stipe. Tubes short, decurrent, durty yellow to rusty yellowis. Pores large, angular, concolorous with the tubes, darkening when bruised. Smell not distinctive. Taste not distinctive. 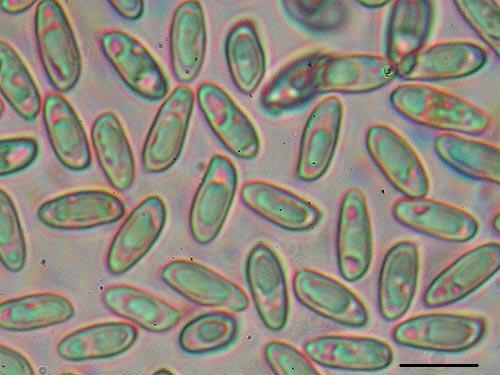 Spores 9–12 × 3.5–5 μm. Habitat. Plantations of Douglas’ fir (Pseudotsuga), with which tree the fungus is strictly mycorrhizal. Distribution. 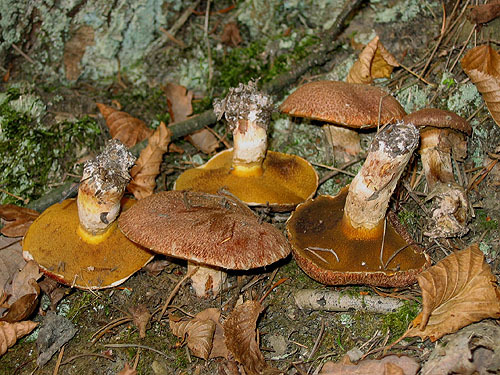 North American fungus, in Europe introduced through its mycorhizal host, and currently known in Bosna and Herzegovina, Bulgaria, Czech Republic, Denmark, Germany, Hungary, Italy (incl. Sicily), Slovakia, and UK. Similarity. 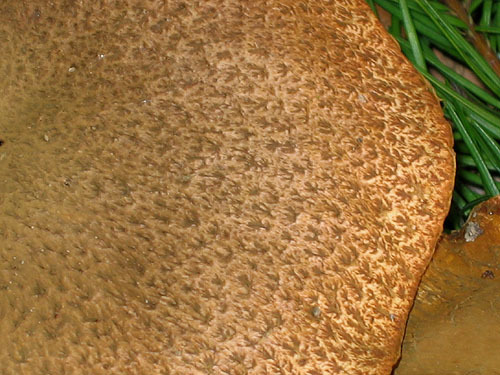 Although confusion is highly unlikely, compare with Boletinus cavipes, which has hollow stipe and unchanging flesh, and grows under larch (Larix). 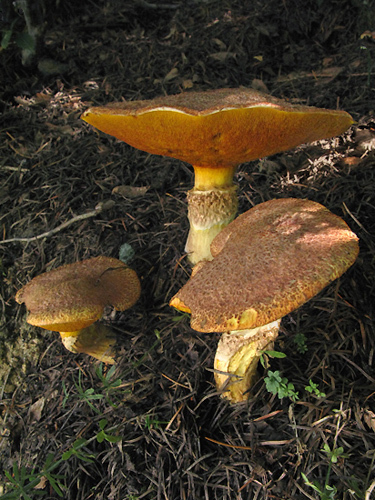 In North America there are some other Suillus species growing under Douglas’ fir (S. caerulescens A.H. Sm. & Thiers, S. ponderosus A.H. Sm. & Thiers). However none of them have been found in Europe so far. Note. Some European authors (e.g. 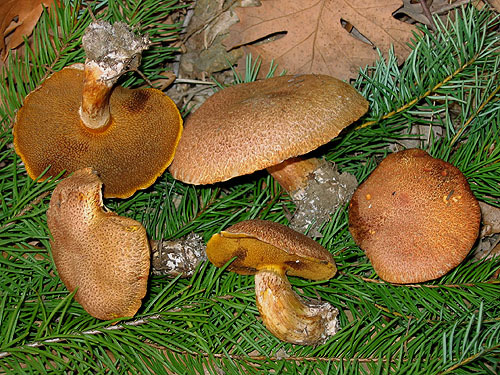 Watling & Hills 2005) prefer to use the name Suillus amabilis (Peck) Singer. 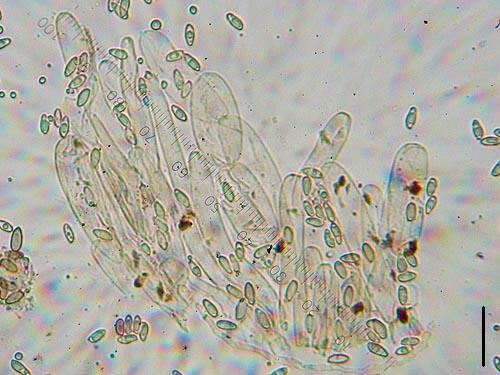 There has been much discussion in the mycological literature whether S. lakei and S. amabilis should be considered identical. See Singer (1966), Smith & Thiers (1967), Thiers (1975; available online). Singer, R. 1966. The type of Boletus amabilis. – Mycologia 58: 157–159. Smith, A.H. & Thiers, H.D. 1967. 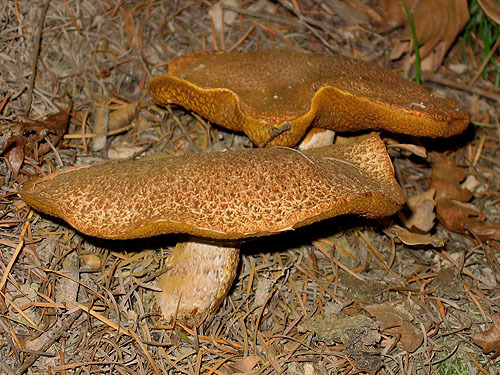 Comments on Suillus amabilis and Suillus lakei. – Mycologia 59: 361–367.